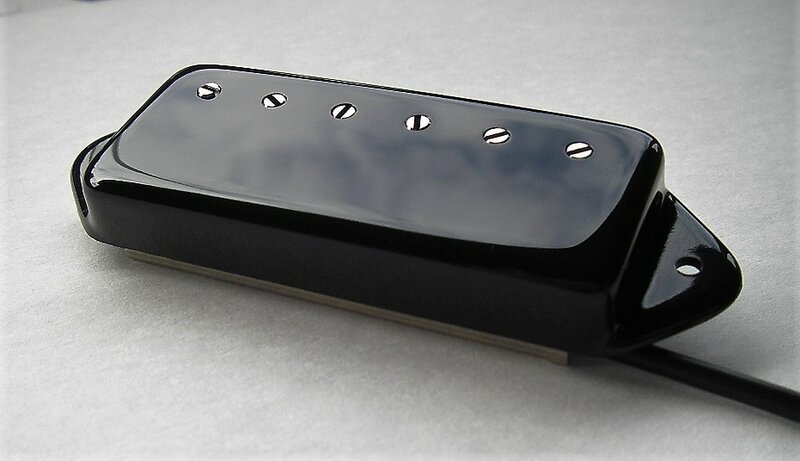 This pickup is based on early -70's "Patent Sticker" Mini Humbucker used on Les Paul Deluxe. Sound is bright but still not harsh. 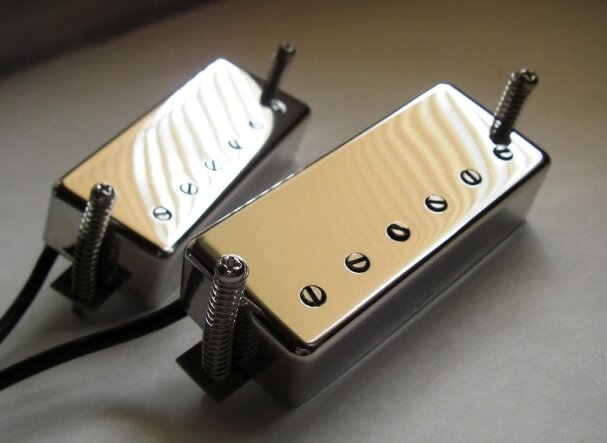 Bridge pickup is wound with thinner magnet wire for more output and better pickup balance. Short rough cast Alnico 5 bar magnet and true size bobbins. Available with pickquard mounting option or with "Deluxe baseplate" with mounting ears drilled out. The pickup comes potted in order to avoid the microphonics. ​Nickel silver base plate and cover. ​Two or four conductor shielded wire. Wound with Plain Enamel magnet wire. Slightly more output and fuller tone. Slightly degaussed Long rough cast Alnico 5 bar magnet and true size bobbins. Available with pickquard mounting option or with "Deluxe baseplate" with mounting ears drilled out. 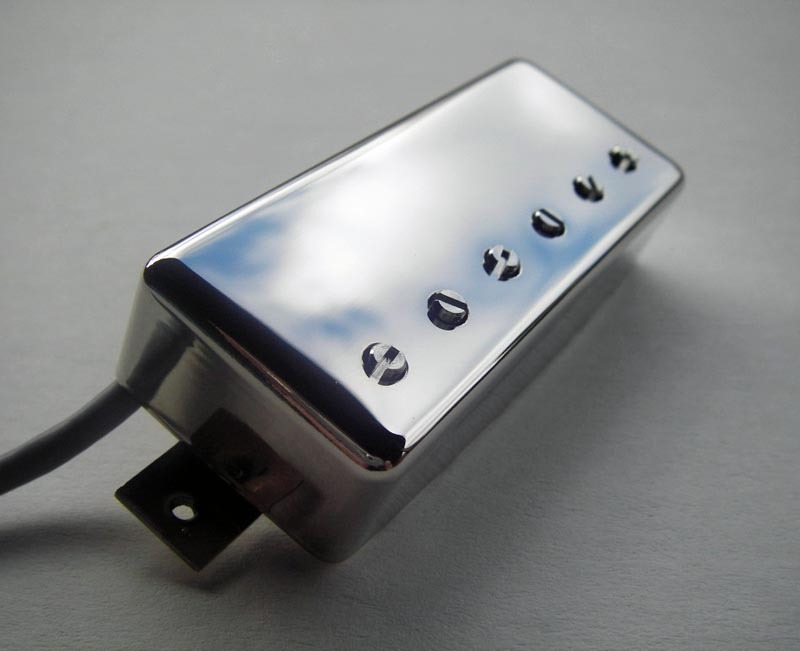 Bridge pickup is wound with thinner Plain Enamel magnet wire for more output and better pickup balance. The pickup comes potted in order to avoid the microphonics. Plain Enamel 42 magnet wire. Long rough cast Alnico 2 bar magnet. Softer attack and lower output. Bright but warm tone. Works great with crunch sound. Slightly taller bobbins on bridge pickup allows to wind with Plain Enamel 42 magnet wire up to 6.9 K. Result is good pickup balance and almost PAF style bridge pickup sound. Available with pickquard mounting option or with "Deluxe baseplate" with mounting ears drilled out. The pickup comes potted in order to avoid the microphonics. Nickel-silver base plate and cover. All my Mini Humbucker models are available with Mini Dog Ear cover. Price is same as with nickel-silver cover.